"Under water" redirects here. For the term relating to finance, see Negative equity. "Undersea" redirects here. For the EP by The Antlers, see Undersea (EP). For other uses, see Underwater (disambiguation). Underwater refers to the region below the surface of water where the water exists in a swimming pool or a natural feature (called a body of water) such as an ocean, sea, lake, pond, or river. For solids and liquids like bone, muscle and blood, this added pressure is not much of a problem; but it is a problem for any air-filled spaces like the mouth, ears, paranasal sinuses and lungs. This is because the air in those spaces reduces in volume when under pressure and so does not provide those spaces with support against the higher outside pressure. Even at a depth of 8 ft (2.4 m) underwater, an inability to equalize air pressure in the middle ear with outside water pressure can cause pain, and the tympanic membrane (eardrum) can rupture at depths under 10 ft (3 m). The danger of pressure damage is greatest in shallow water because the ratio of pressure change is greatest near the surface of the water. For example, the pressure increase between the surface and 10 m (33 ft) is 100% (100 kPa to 200 kPa), but the pressure increase from 30 m (100 ft) to 40 m (130 ft) is only 25% (400 kPa to 500 kPa). Any object immersed in water is provided with a buoyant force that counters the force of gravity, appearing to make the object less heavy. If the overall density of the object exceeds the density of water, the object sinks. If the overall density is less than the density of water, the object rises until it floats on the surface. With increasing depth underwater, sunlight is absorbed, and the amount of visible light diminishes. Because absorption is greater for long wavelengths (red end of the visible spectrum) than for short wavelengths (blue end of the visible spectrum), the colour spectrum is rapidly altered with increasing depth. White objects at the surface appear bluish underwater, and red objects appear dark, even black. Although light penetration will be less if water is turbid, in the very clear water of the open ocean less than 25% of the surface light reaches a depth of 10 m (33 feet). At 100 m (330 ft) the light present from the sun is normally about 0.5% of that at the surface. The euphotic depth is the depth at which light intensity falls to 1% of the value at the surface. 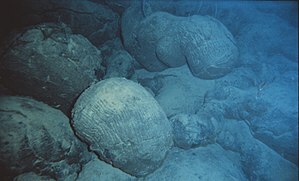 This depth is dependent upon water clarity, being only a few metres underwater in a turbid estuary, but may reach up to 200 metres in the open ocean. At the euphotic depth, plants (such as phytoplankton) have no net energy gain from photosynthesis and thus cannot grow. There are three layers of ocean temperature: the surface layer, the thermocline, and the deep ocean. The average temperature of surface layer is about 17 °C. About 90% of ocean's water is below the thermocline in the deep ocean, where most of the water is below 4 °C. Water conducts heat around 25 times more efficiently than air. Hypothermia, a potentially fatal condition, occurs when the human body's core temperature falls below 35 °C. Insulating the body's warmth from water is the main purpose of diving suits and exposure suits when used in water temperatures below 25 °C. Sound is transmitted about 4.3 times faster in water (1,484 m/s in fresh water) as it is in air (343 m/s). The human brain can determine the direction of sound in air by detecting small differences in the time it takes for sound waves in air to reach each of the two ears. For these reasons divers find it difficult to determine the direction of sound underwater. However, some animals have adapted to this difference and many use sound to navigate underwater. ^ "Temperature of Ocean Water". Windows to the Universe. National Earth Science Teachers Association (NESTA). Wikimedia Commons has media related to Underwater. Dueker, C. W. 1970, Medical aspects of sport diving. A.S. Barnes and Co., New York. 232 pp. This page was last edited on 31 January 2019, at 00:00 (UTC).